At Utah Orthodontic Care, it’s our mission to provide you with comfortable, effective orthodontic treatment. Whether you’re interested in ClearCorrect or traditional metal braces, our skilled team of Salt Lake City braces providers are here to serve. 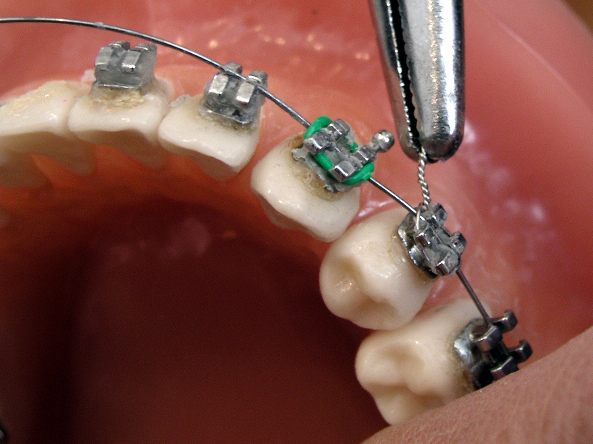 However, with traditional style braces, it’s not uncommon to experience discomfort or irritation due to wires. That’s why we’ve put together this quick reference guide of what you can do if you have a wire irritating you. Using something gentle, such as a cotton swab or pencil eraser, carefully move the wire away from the irritated area. In some cases, this can quickly and easily resolve the issue. However, sometimes the wire can move back into place after a while, or it may lead to irritation of a different area. If moving the wire doesn’t work, cover the end of the wire to shield your mouth. Use a small piece of dental wax to cover the wire, or, if dental wax isn’t available, you can also use a small piece of cotton ball. While this is only a temporary fix, it can provide the relief you’re looking for in a pinch! If you’re experiencing a great amount of pain and the former options are providing little to no relief, your last resort should be to clip the wire. Begin by washing and sterilizing a pair of finger nail clippers with rubbing alcohol. Next, use the sterilized nail clippers to clip off the offending piece of wire. Note the area that was giving you trouble, as it’s best to mention this to your Greater Salt Lake area orthodontic provider during your next visit. As your trusted Salt Lake City braces provider, the skilled orthodontic professionals at Utah Orthodontic Care are committed to providing comfortable, effective treatment. We provide affordable treatment for patients of all ages, no matter what the orthodontic issue. If you’re ready for a healthy, radiant new smile, contact us today to schedule an appointment at one of our many convenient locations throughout the Greater Salt Lake area. We look forward to seeing you!